Local backup - a copy of a file or document. This copy is located on the computers hard disk drive or on the storage is plugged in directly to the computer being backed up. Local backup storage: internal hard drive, optical discs (CD, DVD), Network Attached Storage (NAS), magnetic tape drive, etc. Backing up to the internal hard drive provides a minimal guard of ensuring that you have a way to restore your data. This minimal level of safe guard is because if something causes your hard disk drive to fail in your PC, or corrupts your data, you may loose the backup copy also. 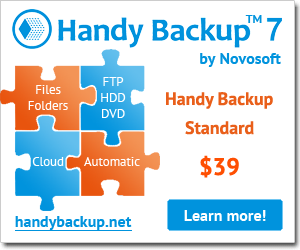 Handy Backup software can provide a local backup for wide range of storages. The glossary contains 178 terms. The current section Backup Storage contains 4 terms.